In case you’re not following it, the Netherlands came out winners in a World Cup round against Mexico. With the score tied at 1-1, Arjen Robben got himself into the box and won a penalty. Was it a penalty or was it a dive? That answer will remain unknown. What I do know is why I do and will cheer for Mexico. Mexico is our neighbor – certainly more so from my own vantage point in the desert Southwest but it butts up squarely against the states of California, Arizona, New Mexico and Texas. Despite incredible travel opportunities, Mexico is and always will be the country that I’ve visited most. I love the colors and the food and the language and the diversity of terrain from crystal blue waters and pyramids to the cool pines of the Copper Canyon and the extreme density of culture in Mexico City. But I also cheer for Mexico because their prosperity is good for us, especially those of us in border communities. In any given year, Arizona experiences more than 24 million legal border crossings by Mexican nationals. I have no idea what the number is for California or Texas but would be surprised if our crossings do not pale compared to those. They come for leisure activities like visiting friends, vacation and shopping and they come for business. Because of our proximity, less than one percent of the visitors fly to our state. Many are daytime crossers and the rest visit via automobile. Each and every day, Mexican visitors spend over $7,350,000 in Arizona stores, eateries, hotels and other businesses and in some border communities, more than 50% of the sales tax revenue is attributable to Mexico. As a state and as a country we wrestle with border issues of immigration, useful guest worker programs, unaccompanied minors, and human trafficking. There is no simple solution to these issues but there is no denying that if it is bad for Mexico, it is bad for us. That is why I cheer for Mexico. 70 percent of Mexican recipes rely on beans. As a college student, they were my staple and now, my boys love them as much. Rinse beans and soak them in water overnight. Discard water and cook in boiling water. Add the garlic, onion, and chiles. If the beans dry at any time, add more water. Simmer for 3 – 6 hours until tender. For variations, try adding a bottle of your favorite salsa, cumin or tomatoes. I often do these in a slow cooker for ease. Pinto Beans was our Monday night meal cornbread & fried potatoes accompanied the beans. Now that I live in Yuma I have grown appreciative of the people of Mexico. The border wait to get across to do all the things you listed is crazy busy. I have met so many amazing people living on the border. Another home run or should I say goal on this article Tammy. I’m so excited that you are adding a border perspective to you repertoire. 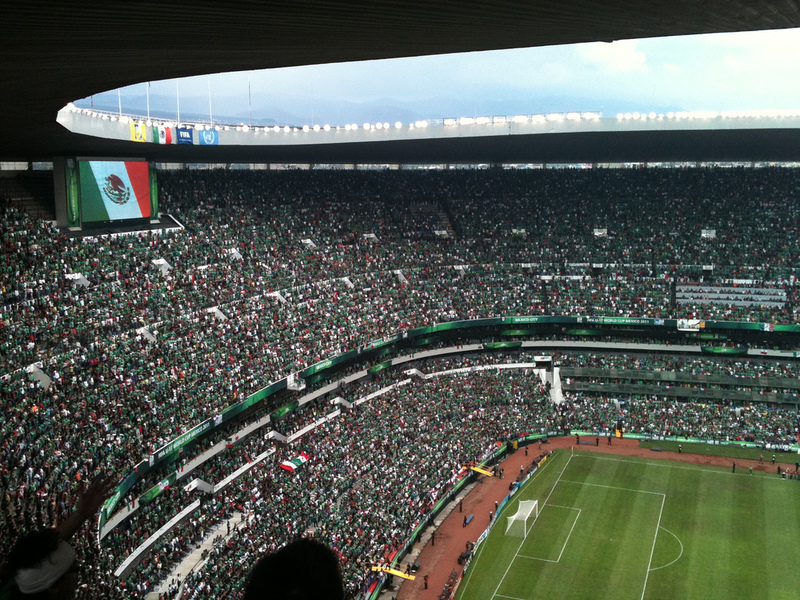 Thank you for sharing with us why you cheer for Mexico! You have enlightened me and given me something to cheer for now too! Mexico is an important neighbor and it’s easy for us to forget that. As a dedicated “gooner” who was the Arsenal player you had a crush on? Oh my, who do you think it might have been? BRAVO!!! I love hearing this from an Arizonian! Opinions on immigration are often woefully lacking facts – thanks for adding positiely to the discussion, Tammy! Woefully lacking facts Diane! It’s a very important economy for us. Wonderful information and I applaude you for sharing this information, Tammy. I am also a bean mama and enjoy them almost every day. Reminds me of a trip to Mexico with you and your folks and you and Mom made a huge batch of pinto beans. So good and when I got home, I made more and have made them ever since. Thanks tammy. Great article! Thanks Sally. I do love them and they are a staple in many parts of Mexico. WOW! Some real positive, informative info about our neighbors, against the ugly backdrop in the news. Kudos to you Tammy. Following the World Cup as best I can with time constraints and the “coincidence” of the tennis tournament across the Atlantic which was my first love. But so loving the rising popularity of this sport bringing the world together. Talk about color!! I agree with you on the color. It is fantastic to watch. The Mexican economy significantly drives our own and more so since Mexico increased sales tax. Many individuals come to the U.S. to do weekly grocery shopping now. If you ever see the blog Life on a Colorado Farm – Linda is a pinto bean farmer and they are just so good. It isn’t an easy solution and there will always be someone who doesn’t agree with the outcomes. Right now it is particularly tragic because they are all children. You know your football, Tammy 😀 Excellent post, and the beans alone make me want to cheer for Mexico. That, and England coming to such an inglorious end so very early in the proceedings. Fixed it! Thanks Kate. It’s always good to have another back up, isn’t it? It is refreshing to hear this positive take on US-Mexico relations. We get so caught up on what we have, so afraid that someone else might want it, we don’t look up to see how we got it. Thanks. Tammy! What a great post, Tammy ! Thank you. Although I live on the other side of the pond, I hoped Mexico would win. They had a great team, beautiful collective engagement in the game and a fantastic goal keeper, Ochoa. Of course, I also cheered for the Swiss team. At the end the Netherlands won, so it is. Beans are a favorite on our table and I will try your recipe, for sure. I also like white/red beans in salad with basilic. Delicious. Where I live there are so many who do not understand what a vital part Mexico plays in our economy. There is no solution but to cheer for them!! Let me know how you do with the beans.